Mysteries to Solve: Hubble Space Telescope images of Pluto reveal a complex-looking and variegated world with white, dark-orange, and charcoal-black terrain. How will our “view” of Pluto change after New Horizons visits next summer? Pluto holds a special place in our hearts. We see Pluto as a mysterious world that, being similar in some ways to our own planet, represents our oneness with infinite nature. At the same time, being different from Earth in so many ways, Pluto reminds us how unlike the rest of the universe we are. We’re less than a year from seeing Pluto up close for the first time. Will our feelings toward Pluto change when we finally see what it really looks like? Will the loss of mystery bring us to regard this small orb as just another creature in the solar system menagerie, or will familiarity endear us even more to the uniqueness of this little world? 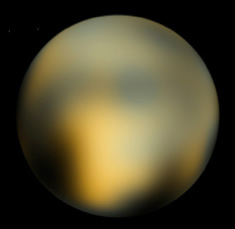 Will visiting Pluto mark the end of our exploration of the solar system, or usher in a fresh era in our cosmic voyage? Will we believe that we have seen it all, or will we be ever more anxious to see the view from the next summit? Visiting Pluto will reveal the depths of our curiosity. Human history suggests that fathoms remain. Don Jennings is a New Horizons co-investigator from NASA’s Goddard Space Flight Center in Greenbelt, Md. He leads the team operating the LEISA composition mapper, part of New Horizons’ Ralph instrument.